Collimation and beam cleaning studies are carried out with the well established SixTrack  code, extended for tracking large numbers of halo particles, and to take into account halo interaction with arbitrarily placed collimators. Particles are transported through the lattice element by element and their phase space coordinates are transformed according to the type of element. When a particle hits a collimator jaw, it is randomly scattered through matter. The effect of collimator scattering is modeled using COLLTRACK/K2 [2, 3] routines. · Various types of halo and possibility of including diffusion. · Tracking of large particle ensembles (~106 protons) over hundreds of turns. · fort.2 (generated by MAD-X), defining the lattice of the machine without magnetic field errors. · fort.3 (modified from the one used for SixTrack without collimation), including tracking parameters (number of particles and turns), type of beam, type of halo. MAD-X is used to generate the LHC lattice, the optics and eventual orbit and focusing errors. F. Schmidt: ”SixTrack, User’s Reference Manual”, CERN SL/94-56 (AP), 1994 (Update July 2008). T. Trenkler, J.B. Jeanneret: “K2, A software package evaluating collimation systems in circular colliders (manual)”, CERN SL/94–105 (AP), 1994. G. Robert-Demolaize, R. Assmann, S. Redaelli, F. Schmidt, CERN, Geneva, Switzerland: A new version of SixtTrack with collimation and aperture interface (PAC 2005). R. Assmann, J.B. Jeanneret, D. Kaltchev: “Status of Robustness Studies for the LHC Collimation”, APAC 2001. · Implementation of the LHC aperture model with analysis of loss locations for all tracked protons. The halo is represented in the phase diagram Y (offset from beam orbit axes),Y' (angle w.r.t. beam orbit axes) in Figure 1. 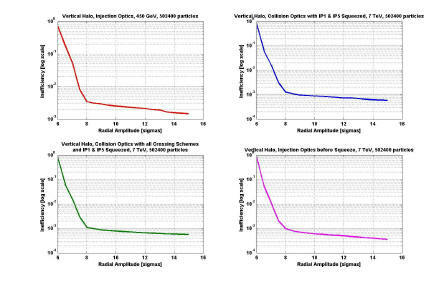 One defines the Impact Parameter b (see Figure 2.) as the transverse offset between the jaw surface and the impact point. b typically equals 1um at the first impact. Figure 1: Halo particles in the phase diagram. this database including the name, length, orientation and material of every single collimator of the ring (1 file per Collimation System Phase though). Apart from these two, the other required SixTrack files are produced via MAD-X and its conversion module. MAD-X can produce ready-to-use input files for SixTrack : it must be run with LHC lattice and optics files V6.500 (or more recent layouts), 'thin lens' approximation, and the addition of collimators. Try for example to run it with " madx < GenerateSixTrInput.madx ". For "perfect" machines, the files produced are fc.2 and fc.34 (optional) which must be renamed (for SixTrack) fort.2, and fort.34. The file fort.3 is built expressly and found in the examples annexed (see also below). The collimator database is stored in files named CollDB_V6.500_[type]_st. [beam].data, with [type] being either inj for injection case or lowb for collision case, and [beam] being b1 or b2. The introduction of the optic parameter β allows studies of error scenarios (orbit distortion, beta-beating) and/or to see the effect of misaligned collimators. This structure is then repeated within the file for each of the collimators to be included in the study. The latest version of the SixTrack code (compiled by Thomas Weiler) for Collimation Studies can be found at : SixTrack(TW) [note]. Source code: SixTrack source code can be found in the SixTrack code web-page (restricted access). with corresponding output files: amplitude.dat, betafunctions.dat, efficiency.dat, FirstImpacts.dat, FlukaImpacts.dat. [note] It should be noted that to date (Feb. '09) latest modifications to SixTrack code have not been implemented into the CVS version. In order to keep SixTrack as close as possible to its original form (i.e. to avoid the need of multiples input files), it has been decided to include a new block in the parameter file for SixTrack (fort.3). (5) 8.3 8.3 8.3 8.3 8.3 8.3 8.3 8.3 5. 15. (10) .FALSE. .FALSE. 0 .TRUE. TCP.C6L7.B1 .FALSE. .TRUE. .TRUE. .TRUE. (11) 0. 0. 0. 0. (12) 0 0 0 0 0 0 0 0 0 0 .FALSE. (14) 0. 0. .FALSE. .FALSE. (17) .TRUE. .FALSE. WAbsVertLowbcoll 101 1 1. MYNEX : Ax normalized amplitude of particles (in sigma units) in the X direction. MDEX : dAx smear (in sigma units) of the beam halo around Ax (in X direction). MYNEY : Ay normalized amplitude of particles (in sigma units) in the Y direction. MDEY : dAy smear (in sigma units) of the beam halo around Ay (in Y direction). FILENAME_DIS: name of the distribution file to be read if DO_THISDIS is set to 4. ENERROR: energy spread of the tracked beam (read only if DO_THISDIS = 3). BUNCHLENGTH: bunch length of the tracked beam in millimeters (read only if DO_THISDIS = 3). (4) DO_NSIG: logical, if TRUE use collimators settings from fort.3. If FALSE from CollDB_V6.500_[type]_st.[beam].data. [note1] One-sided collimators (only positive x). DO_ONESIDE : logical, switches on/off the collimator being one-sided. Only positive jaw. 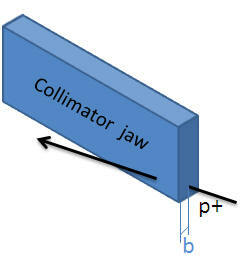 If the negative jaw is to be used, it is necessary to turn collimator by 180 degrees in the collimator database file (CollDB_V6.500_[type]_st.[beam].data). NOTE: The distribution with PENCIL_DISTR=2 is used when wanting to simulate the loss of a magnet. One should know that a large value for NLOOP combined with DOWRITE_TRACKS set to .TRUE. may create really huge output files, depending on the optics you run with. For example, in our current simulations, a run with NLOOP = 50 (i.e. simulations over 3200 particles) for the LHC collision optics will produce a tracks2.dat file of 2.8 Go (!! ), for just 1/1000th of the statistics we need. -- DO_THISDIS = 1 : distribution in the plane for which the parameters are specified ONLY: flat distribution in the selected plane between Ax ± δAx (horizontal) or Ay ± δAy (vertical). The amplitude in the other plane is zero. -- DO_THISDIS = 2 : distribution in the plane for which the parameters are specified + a Gaussian distribution cut at 3 s in the other plane. -- DO_THISDIS = 3 : distribution in the plane for which the parameters are specified + a Gaussian distribution cut at 3 s in the other plane + energy spread given by ENERROR (nominally 3.06E-04 at 450GeV and 1.129E-04 at 7TeV) and a longitudinal component given by BUNCHLENGTH (nominally 11.24cm at 450GeV and 7.55cm at 7TeV). -- DO_THISIDS = 4 : reads an external file that contains the beam distribution to be tracked. Click on the picture then "Save as.." to get a Powerpoint file with enlarged curves. The main purpose of the code is to produce loss maps along the ring, in order to compare the level of local beam losses with the magnetic quench limit. 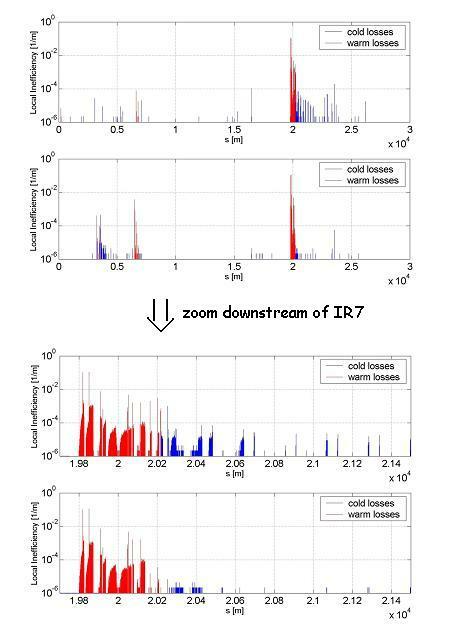 It can be seen in both figures (full ring and zoom downstream of IR7) that the complete collimation system (bottom plots of each figure) has a significantly better performance than the betatron cleaning system with primary and secondary collimators alone: there is a notable reduction of the loss spikes in the arc downstream of the IR7 insertion region, where the betatron cleaning is located. At the same time, additional losses are observed in IR2, where the TDI injection protection element is intercepting the secondary halo at its nominal setting.